DoctorBike is on health sabbatical until further notice but is doing light work at home. Get in touch via the DoctorBike facebook page. Will DoctorBike be in the market this Saturday? Check DoctorBike's facebook page to find out. 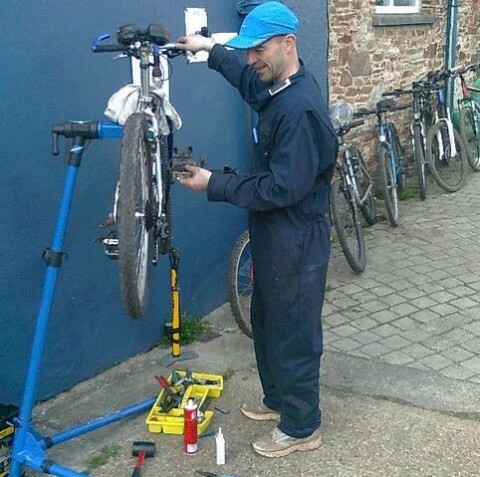 Get your bike fixed for free (or barter, Totnes Pounds, time swap, pies from Riverford and other local independent shops or even a hug) by a qualified bike doctor (C&G level II). You'll find him on the ramp leading up to the Civic Hall on Saturdays, from appx. 11am to 4pm. He also does maintenance courses from time to time. See DoctorBike's website for more information.